For the historian, see Andrey Nikolayevich Sakharov. This name uses Eastern Slavic naming customs; the patronymic is Dmitrievich and the family name is Sakharov. Sakharov was born in Moscow on May 21, 1921. His father was Dmitri Ivanovich Sakharov, a private school physics teacher and an amateur pianist. His father later taught at the Second Moscow State University. Andrei's grandfather Ivan had been a prominent lawyer in the Russian Empire who had displayed respect for social awareness and humanitarian principles (including advocating the abolition of capital punishment) that would later influence his grandson. Sakharov's mother was Yekaterina Alekseyevna Sakharova, a great-granddaughter of the prominent military commander Alexey Semenovich Sofiano (who was of Greek ancestry). Sakharov's parents and paternal grandmother, Maria Petrovna, largely shaped his personality. His mother and grandmother were churchgoers; his father was a nonbeliever. When Andrei was about thirteen, he realized that he did not believe. However, despite being an atheist, he did believe in a "guiding principle" that transcends the physical laws. We can visualize that neutral spinless maximons (or photons) are produced at ''t'' < 0 from contracting matter having an excess of antiquarks, that they pass "one through the other" at the instant ''t'' = 0 when the density is infinite, and decay with an excess of quarks when ''t'' > 0, realizing total CPT symmetry of the universe. All the phenomena at t < 0 are assumed in this hypothesis to be CPT reflections of the phenomena at t > 0. His legacy in this domain are the famous conditions named after him: Baryon number violation, C-symmetry and CP-symmetry violation, and interactions out of thermal equilibrium. Sakharov was also interested in explaining why the curvature of the universe is so small. This lead him to consider cyclic models, where the universe oscillates between contraction and expansion phases. In those models, after a certain number of cycles the curvature naturally becomes infinite even if it had not started this way: Sakharov considered three starting points, a flat universe with a slightly negative cosmological constant, a universe with a positive curvature and a zero cosmological constant, and a universe with a negative curvature and a slightly negative cosmological constant. Those last two models feature what Sakharov calls a reversal of the time arrow, which can be summarised as follow. He considers times t > 0 after the initial Big Bang singularity at t = 0 (which he calls "Friedman singularity" and denotes Φ) as well as times t < 0 before that singularity. He then assumes that entropy increases when time increases for t > 0 as well as when time decreases for t < 0, which constitutes his reversal of time. Then he considers the case when the universe at t < 0 is the image of the universe at t > 0 under CPT symmetry but also the case when it is not so: the universe has a non-zero CPT charge at t = 0 in this case. Sakharov considers a variant of this model where the reversal of the time arrow occurs at a point of maximum entropy instead of happening at the singularity. It should be noted that in those models there is no dynamic interaction between the universe at t < 0 and t > 0. Sakharov married a fellow human rights activist, Yelena Bonner, in 1972. Sakharov's ideas on social development led him to put forward the principle of human rights as a new basis of all politics. In his works he declared that "the principle 'what is not prohibited is allowed' should be understood literally", defying what he saw as unwritten ideological rules imposed by the Communist party on the society in spite of a democratic (1936) USSR Constitution. "I am no volunteer priest of the idea, but simply a man with an unusual fate. I am against all kinds of self-immolation (for myself and for others, including the people closest to me)." In a letter written from exile, he cheered up a fellow physicist and human rights activist with the words: "Fortunately, the future is unpredictable and also – because of quantum effects – uncertain." For Sakharov the indeterminacy of the future supported his belief that he could, and should, take personal responsibility for it. In 2004, with the approval of Yelena Bonner, an annual Sakharov Prize for journalism was established for reporters and commentators in Russia. Funded by former Soviet dissident Pyotr Vins, now a businessman in the US, the prize is administered by the Glasnost Defence Foundation in Moscow. The prize "for journalism as an act of conscience" has been won over the years by famous journalists such as Anna Politkovskaya and young reporters and editors working far from Russia's media capital, Moscow. The 2015 winner was Yelena Kostyuchenko. The fictitious interplanetary spacecraft Cosmonaut Alexei Leonov from the novel 2010: Odyssey Two by Arthur C. Clarke is powered by a "Sakharov drive". The novel was published in 1982, when Sakharov was in exile in Nizhny Novgorod, and was dedicated both to Sakharov and to Alexei Leonov. Sakharov, Andrei (1974). Sakharov speaks. Collins: Harvill Press. ISBN 978-0-00-262755-9. Sakharov, Andrei (1975). My country and the world. Knopf. ISBN 978-0-394-40226-0. Sakharov, Andrei (1978). Alarm and hope. The world-renowned Nobel laureate and political dissident speaks out on human rights, disarmament, and détente. Knopf. ISBN 978-0-394-50369-1. Sakharov, Andrei (1992). Memoirs. Vintage. ISBN 978-0679735953. Sakharov, Andrei (1968). Thoughts on progress, peaceful coexistence and intellectual freedom. Foreign Affairs Publishing Company. ISBN 978-0-900380-03-7. Sakharov; Andrei (July 22, 1968). "Thoughts on progress, peaceful coexistence and intellectual freedom" (PDF). The New York Times. Archived (PDF) from the original on January 13, 2013. Sakharov, Andrei; Tverdokhlebov, Andrei; Albrecht, Vladimir (May 28, 1974). "USSR. The chronicle of current events". Index on Censorship. 3 (3): 87. doi:10.1080/03064227408532355. Sakharov, Andrei; Turchin, Valentin; Medvedev, Roy (June 6, 1970). "The need for democratization". The Saturday Review: 26–27. Sakharov, Andrei (January – March 1974). "Reply to oppression". Rivista di Studi Politici Internazionali. 41 (1): 47–54. JSTOR 42733796. Sakharov, Andrei (March 21, 1974). "How I came to dissent". The New York Review of Books. Sakharov, Andrei (June 13, 1974). "In answer to Solzhenitsyn". The New York Review of Books. Sakharov, Andrei (February 9, 1978). "The death penalty". The New York Review of Books. Sakharov, Andrei (January 21, 1982). "Letter to my foreign colleagues". The New York Review of Books. Sakharov, Andrei; Meiman, Naum (March – April 1982). "The plight of Yuri Orlov". Harvard International Review. 4 (6): 50. JSTOR 42762207. Sakharov, Andrei (July 21, 1983). "A reply to slander". The New York Review of Books. Sakharov, Andrei (March 1, 1984). "A letter to my scientific colleagues". The New York Review of Books. Sakharov, Andrei (March 16, 1987). "Of arms and reforms". Time. Sakharov, Andrei (August 13, 1987). "On accepting a prize". The New York Review of Books. Sakharov, Andrei (February 25, 1988). "A man of universal interests". Nature. 331 (6158): 671–672. Bibcode:1988Natur.331..671S. doi:10.1038/331671a0. Sakharov, Andrei (December 22, 1988). "On Gorbachev: a talk with Andrei Sakharov". The New York Review of Books. Sakharov, Andrei (August 17, 1989). "A speech to the People's Congress". The New York Review of Books. 36 (13): 25–26. Sakharov, Andrei (May 21, 1990). "Sakharov: Sakharov and Solzhenitsyn: a difference in principle". Time. Sakharov, Andrei (May 21, 1990). "Sakharov: years in exile". Time. ^ "Sakharov Human Rights Prize 25th anniversary marked in US". Voice of America. January 15, 2014. ^ a b "Andrei Sakharov: Soviet Physics, Nuclear Weapons and Human Rights". ^ "Andrei Sakharov – Biographical". ^ Bonner, Yelena. Об А.Д. Сахарове (in Russian). Archived from the original on November 18, 2010. Retrieved November 2, 2009. ^ Греки в Красноярском крае (Материалы из книги И.Джухи "Греческая операция НКВД") (in Russian). Archived from the original on November 18, 2010. Retrieved November 2, 2009. ^ Sidney D. Drell, George P. Shultz. Andrei Sakharov: The Conscience of Humanity. Hoover Press. ISBN 9780817918965. I am unable to imagine the universe and human life without some guiding principle, without a source of spiritual 'warmth' that is nonmaterial and not bound by physical laws. ^ "Nobel Prize Laureates from MSU". Moscow State University. Retrieved October 8, 2017. ^ Mastin, Luke (2009). "Andrei Sakharov - Important Scientists". The Physics of the Universe. Retrieved October 8, 2017. ^ a b Zaloga, Steve (17 February 2002). The Kremlin's Nuclear Sword: The Rise and Fall of Russia's Strategic Nuclear Forces 1945–2000. Smithsonian Books. ISBN 1588340074. ^ Sakharov, Andrei (1992). Memoirs. Vintage. ISBN 978-0679735953. ^ Gorelik, Gennady; Bouis, Antonina (2005). The world of Andrei Sakharov: a Russian physicist's path to freedom. Oxford University Press. ISBN 978-0195156201. ^ a b c d e Gorelik, Gennady (2008). "Andrei Sakharov". In Koertge, Noretta (ed.). New dictionary of scientific biography. Detroit: Charles Scribner's Sons/Thomson Gale. ^ Sakharov, A. D. (January 1966). "Взрывомагнитные генераторы" (PDF). Uspekhi Fizicheskikh Nauk (in Russian). 88 (4): 725–734. doi:10.3367/ufnr.0088.196604e.0725. Translated as: Sakharov, A. D. (1966). "Magnetoimplosive generators". Soviet Physics Uspekhi. 9 (2): 294–299. Bibcode:1966SvPhU...9..294S. doi:10.1070/PU1966v009n02ABEH002876. Republished as: Sakharov, A. D.; et al. (1991). "Взрывомагнитные генераторы" (PDF). Uspekhi Fizicheskikh Nauk (in Russian). 161 (5): 51–60. doi:10.3367/UFNr.0161.199105g.0051. Translated as: Sakharov, A. D.; et al. (1991). "Magnetoimplosive generators". Soviet Physics Uspekhi. 34 (5): 387–391. Bibcode:1991SvPhU..34..385S. doi:10.1070/PU1991v034n05ABEH002495. ^ Sakharov, A. D. (December 7, 1982). Collected Scientific Works. Marcel Dekker. ISBN 978-0824717148. ^ Sakharov, A. D. (July 1965). "Начальная стадия расширения Вселенной и возникновение неоднородности распределения вещества". Pi'sma ZhÉTF (in Russian). 49 (1): 345–358. Translated as: Sakharov, A. D. (January 1966). [t "The Initial Stage of an Expanding Universe and the Appearance of a Nonuniform Distribution of Matter"] Check |url= value (help) (PDF). JETP. 22 (1): 241–249. Bibcode:1966JETP...22..241S. ^ a b c Sakharov, A. D. (January 1967). "Нарушение СР–инвариантности, С–асимметрия и барионная асимметрия Вселенной". Pi'sma ZhÉTF (in Russian). 5 (1): 32–35. Translated as: Sakharov, A. D. (January 1967). "Violation of CP invariance, C asymmetry, and baryon asymmetry of the universe" (PDF). JETP Letters. 5 (1): 24–26. Bibcode:1967JETPL...5...24S. Republished as Sakharov, A. D. (May 1991). "Violation of CP invariance, C asymmetry, and baryon asymmetry of the universe" (PDF). Soviet Physics Uspekhi. 34 (5): 392–393. Bibcode:1991SvPhU..34..392S. doi:10.1070/PU1991v034n05ABEH002497. ^ Sakharov, A. D. (January 1967). "Кварк–мюонные токи и нарушение СР–инвариантности". Pi'sma ZhÉTF (in Russian). 5 (1): 36–39. Translated as: Sakharov, A. D. (January 1967). "Quark-Muonic Currents and Violation of CP Invariance" (PDF). JETP Letters. 5 (1): 27–30. Bibcode:1967JETPL...5...27S. ^ Sakharov, A. D. (1969). "Антикварки во Вселенной" [Antiquarks in the Universe]. Problems in Theoretical Physics (in Russian): 35–44. Dedicated to the 30th anniversary of N. N. Bogolyubov. ^ Sakharov, A. D. (1972). "Топологическая структура элементарных зарядов и СРТ–симметрия" [The topological structure of elementary charges and CPT symmetry]. Problems in Theoretical Physics (in Russian): 243–247. Dedicated to the memory of I. E. Tamm. ^ Sakharov, A. D. (April 1979). "Барионная асимметрия Вселенной". Pi'sma ZhÉTF (in Russian). 76 (4): 1172–1181. Translated as: Sakharov, A. D. (April 1979). "The baryonic asymmetry of the Universe" (PDF). JETP Letters. 49 (4): 594–599. ^ a b Sakharov, A. D. (September 1980). "Космологические модели Вселенной с поворотом стрелы времени". Pi'sma ZhÉTF (in Russian). 79 (3): 689–693. Translated as: Sakharov, A. D. (September 1980). "Cosmological models of the Universe with reversal of time's arrow" (PDF). JETP Letters. 52 (3): 349–351. ^ a b Sakharov, A. D. (October 1982). "Многолистные модели Вселенной". Pi'sma ZhÉTF (in Russian). 82 (3): 1233–1240. Translated as: Sakharov, A. D. (October 1982). "Many-sheeted models of the Universe" (PDF). JETP. 56 (4): 705–709. ^ Sakharov, A. D. (August 1984). "Космологические переходы с изменением сигнатуры метрики". Pi'sma ZhÉTF. 87 (2): 375–383. Translated as: Sakharov, A. D. (August 1984). "Cosmological transitions with changes in the signature of the metric" (PDF). JETP. 60 (2): 214–218. ^ Sakharov, A. D. (September 1986). "Испарение черных мини–дыр и физика высоких энергий". Pi'sma ZhÉTF (in Russian). 44 (6): 295–298. Translated as: Sakharov, A. D. (September 1986). "Evaporation of black mini-holes and high-energy physics" (PDF). JETP Letters. 44 (6): 379–383. Bibcode:1986JETPL..44..379S. ^ Novikov, I. D. (March 1966). "The Disturbances of the Metric when a Collapsing Sphere Passes below the Schwarzschild Sphere" (PDF). JETP Letters. 3 (5): 142–144. Bibcode:1966JETPL...3..142N. ^ Sakharov, A. D. (1967). "Вакуумные квантовые флуктуации в искривленном пространстве и теория гравитации". Proceedings of the USSR Academy of Sciences (in Russian). 177 (1): 70–71. Translated as: Sakharov, A. D. (1991). "Vacuum Quantum Fluctuations in Curved Space and the theory of gravitation" (PDF). Soviet Physics Uspekhi. 34 (5): 394. Bibcode:1991SvPhU..34..394S. doi:10.1070/PU1991v034n05ABEH002498. ^ a b Crump, Thomas (2013). Brezhnev and the Decline of the Soviet Union. Routledge Studies in the History of Russia and Eastern Europe. Routledge. ISBN 978-1-134-66922-6. ^ Gennady Gorelik. The Metamorphosis of Andrei Sakharov. Scientific American, 1999, March. 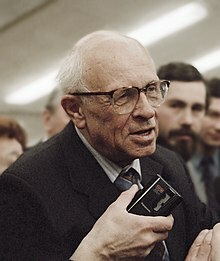 ^ Initially on July 6, 1968, in the Dutch newspaper Het Parool through intermediary of the Dutch academic and writer Karel van het Reve, followed by The New York Times: "Outspoken Soviet Scientist; Andrei Dmitriyevich Sakharov". New York Times. ^ a b c d e f Rubenstein, Joshua; Gribanov, Alexander (2005). The KGB File of Andrei Sakharov. Joshua Rubenstein, Alexander Gribanov (eds. ), Ella Shmulevich, Efrem Yankelevich, Alla Zeide (trans.). New Haven, CN. ISBN 978-0-300-12937-3. ^ Подрабинек, Александр (2014). Диссиденты [Dissidents] (in Russian). Moscow: АСТ. ISBN 978-5-17-082401-4. ^ "30.12 Materials about Sakharov". A Chronicle of Current Events. January 16, 2016. ^ Y.B. Sakharov: Acceptance Speech, Nobel Peace Prize, Oslo, Norway, December 10, 1975. ^ a b Y.B. Sakharov: Peace, Progress, Human Rights, Sakharov's Nobel Lecture, Nobel Peace Prize, Oslo, Norway, December 11, 1975. ^ Gorelik, Gennady (2005). The World of Andrei Sakharov: A Russian Physicist's Path to Freedom. Oxford: Oxford University Press. ISBN 978-0-19-534374-8. ^ "Humanist of the Year". Archived from the original on January 14, 2013. Retrieved November 21, 2012. ^ The Bukovsky Archives, 29 August 1985. ^ Michael MccGwire (1991). Perestroïka and Soviet national security. Brookings Institution Press. p. 275. ISBN 978-0-8157-5553-1. ^ "IHEU Awards | IHEU". IHEU. Retrieved December 2, 2018. ^ The Bukovsky Archives, 14 November 1989. ^ Coleman, Fred (1997). The Decline and Fall of the Soviet Empire: Forty Years That Shook the World, from Stalin to Yeltsin. New York: St. Martin's. p. 116. ^ "Sakharov Prize Network". European Parliament. Retrieved December 10, 2013. ^ "No 49 : 14 May 1978". A Chronicle of Current Events. October 7, 2013. ^ "Glasnost defence foundation digest No. 734". ^ The KGB File of Andrei Sakharov Archived May 21, 2007, at the Wayback Machine, online version with original texts and the English translations in English and in Russian (text version in Windows-1251 character encoding and the pictures of the original pages). ^ Aaron Curtiss (November 22, 1991). "Sakharov Junction". Los Angeles Times. Los Angeles. Archived from the original on November 18, 2010. Retrieved September 14, 2010. ^ Anderson, Susan; Bird, David (August 10, 1984). "New York day by day; human rights reminder posted near Soviet mission". The New York Times. ^ "Alexander Gradsky official website" (in Russian). Retrieved February 3, 2013. ^ "Andrei Sakharov, 68, Soviet 'Conscience,' Dies". The New York Times. Retrieved March 24, 2018. "100,000 honour Andrei Sakharov". The Glasgow Herald. December 18, 1989. p. 4. Information, Reed Business (April 30, 1981). "An honourable dissident". New Scientist. 90 (1251): 266. "Andrei Sakharov addresses grads". The Lewiston Daily Sun. June 15, 1987. p. 14. "Andrei Sakharov ends lone hunger strike". Eugene Register-Guard. August 7, 1984. p. 4A. "Exile of Andrei Sakharov is deplored". The Telegraph. January 23, 1980. p. 2. "How Sakharov won exit visa for his wife". Chicago Tribune. February 24, 1986. "President honors Andrei Sakharov". Sarasota Herald-Tribune. May 19, 1983. p. 7A. "Russia orders end of internal exile for Andrei Sakharov, noted dissident". The Tuscaloosa News. December 19, 1986. "Sakharov case spotlights Soviet efforts against dissidents". The Hour. May 26, 1984. "Sakharov in a plea on prisoners". The New York Times. September 4, 1986. "Sakharov is "symbol" of fight for freedom: Russian dissident scientist awarded Nobel Peace Prize". Observer–Reporter. October 10, 1975. "Sakharov letter describes torment". Chicago Tribune. February 16, 1986. "Sakharov speaks out on repression, detente (Sakharov's letter to Anatoly P. Aleksandrov, president of the Soviet Academy of Sciences)". The Ukrainian Weekly. LXXXVII (31). December 28, 1980. Information, Reed Business (May 7, 1981). "Scientists meet in New York to honour Sakharov". New Scientist. 90 (1252): 332. "Soviet opposition left leaderless by passing of Andrei Sakharov". Eugene Register-Guard. December 17, 1989. p. 18A. "Soviet Union: Sakharov's defense". Time. September 24, 1973. "Soviet Union: a warning for Sakharov". Time. November 5, 1973. "Soviet Union: a travel permit for Sakharov". Time. October 31, 1988. "The blessed curse of Andrei Sakharov". Chicago Tribune. November 17, 1988. "The undefeated Sakharovs". Chicago Tribune. December 28, 1986. "Trying to help Andrei Sakharov". The Hour. March 1, 1980. p. 23. Altshuler, Boris (February 2012). "Andrei Sakharov today: lasting impact on science and society". Physics-Uspekhi. 55 (2): 176–182. Bibcode:2012PhyU...55..176A. doi:10.3367/UFNe.0182.201202h.0188. Applebaum, Anne (October 20, 2005). "Hero". The New York Review of Books. Bailey, George (1989). The making of Andrei Sakharov. Allen Lane. ISBN 978-0713990331. Bohlen, Celestine (January 11, 1987). "Sakharov describes loneliness of life in Gorki". The Washington Post. Bonner, Yelena (May 16, 1986). "Yelena Bonner tells of medical abuse of her husband". Science. 232 (4752): 821. Bibcode:1986Sci...232..821H. doi:10.1126/science.3704629. Bonner, Elena (1988) . Alone together (3 ed.). New York: Vintage Books. ISBN 978-0394755380. Carroll, Nicholas (February 25, 1981). "The loneliness of Andrei Sakharov". The Montreal Gazette. p. 23. Clementi, Marco (2002). Il diritto al dissenso: il progetto costituzionale di Andrej Sacharov [The right to dissent: Andrei Sakharov's constitutional project] (in Italian). Rome: Odradek Edizioni. ISBN 978-8886973441. Dornan, Peter (1975). "Andrei Sakharov: the conscience of a liberal scientist". In Tökés, Rudolf (ed.). Dissent in the USSR: politics, ideology, and people. Johns Hopkins University Press. pp. 354–417. ISBN 978-0-8018-1661-1. Drell, Sidney (May 2000). "Andrei Sakharov and the nuclear danger". Physics Today. 53 (5): 37–41. Bibcode:2000PhT....53e..37D. doi:10.1063/1.883099. Drell, Sidney; Hoagland, Jim; Shultz, George (June 25, 2015). "The man who spoke truth to power: Andrei Sakharov's enduring relevance". Foreign Affairs. Drell, Sidney; Shultz, George (2015). Andrei Sakharov: the conscience of humanity. Physics Today. 69. Hoover Press. p. 61. Bibcode:2016PhT....69g..61K. doi:10.1063/PT.3.3240. ISBN 978-0817918965. Drummond, Roscoe (March 7, 1977). "What kind of man is Andrei Sakharov?". Observer–Reporter. p. A4. Eaton, William (July 20, 1985). "Sakharov: Soviet aides defend internal exile: Soviets, challenged on rights, defend treatment of Sakharov". Los Angeles Times. Eaton, William (December 8, 1985). "Tass says Sakharov is only afflicted by 'aging'". Los Angeles Times. Ferullo, Joe; Moore, Suzanne (January 30, 1979). "Talking to Tanya: Sakharov's daughter speaks in Massachusetts". Columbia Daily Spectator. CIII (61): 3. Feshbach, Herman (April 1987). "A meeting with Sakharov". Physics Today. 40 (4): 7–9. Bibcode:1987PhT....40d...7F. doi:10.1063/1.2819974. Fireside, Harvey (Winter 1989). "Dissident visions of the USSR: Medvedev, Sakharov & Solzhenitsyn". Polity. 22 (2): 213–229. doi:10.2307/3234832. JSTOR 3234832. Fisher, Dan (May 24, 1984). "Andrei Sakharov. A prophet without honor among his own people". Los Angeles Times. p. 7A. Furth, Harold (April 30, 1981). "Sakharov: science of a dissident". New Scientist. 90 (1251): 274–278. Ginzburg, Vitaly (2001). "The Sakharov phenomenon". The physics of a lifetime: reflections on the problems and personalities of 20th century physics. Springer. pp. 471–506. doi:10.1007/978-3-662-04455-1_30. ISBN 978-3540675341. Glazov, Yuri (1985). "Pasternak, Solzhenitsyn, and Sakharov". The Russian mind since Stalin's death. D. Reidel Publishing Company. pp. 158–179. doi:10.1007/978-94-009-5341-3_9. ISBN 978-9027718280. Gorelik, Gennady (July 2002). "The metamorphosis of Andrei Sakharov: the inventor of the Soviet hydrogen bomb became an advocate of peace and human rights. What led him to his fateful decision?" (PDF). Scientific American: 27–30. Archived from the original (PDF) on April 5, 2016. Retrieved April 5, 2016. Gottfried, Kurt; Orlov, Yuri (December 19, 1989). "A man who would not be silenced: Sakharov: he saw scientific, political and moral realities as one equation, and he died still warning about 'tomorrow'". The Los Angeles Times. Harasowska, Marta; Olhovych, Orest (1977). The international Sakharov hearing. Smoloskyp Publishers. ISBN 978-0914834113. Harris, Zelda; Richter, Elihu (July 7, 2010). "Andrei Sakharov, Elena Bonner and Gilad Schalit". The Jerusalem Post. Hesse, Natalya; Tolz, Vladimir (April 12, 1984). "The Sakharovs in Gorky". The New York Review of Books. Holloway, David (June 30, 1991). "Moral leader of a nation". Bulletin of the Atomic Scientists. 47 (6): 37–38. Jacobs, Michael (March 1980). "Sakharov exile triggers reaction in US physics community". Physics Today. 33 (3): 133–134. Bibcode:1980PhT....33c.133J. doi:10.1063/1.2913982. Keller, Bill (April 3, 1987). "Sakharov disillusions dissidents". The Chicago Tribune. Kelley, Donald (1982). The Solzhenitsyn-Sakharov dialogue: politics, society, and the future. Greenwood Press. ISBN 978-0313229404. Klehr, Harvey (September 5, 2005). "Sakharov Watch. Fearful police state meets brave dissident". The Weekly Standard. 10 (47). Kline, Edward (December 22, 1986). "Sakharov stands for the individual". Los Angeles Times. Kramer, Mark (December 17, 1989). "His spirit moved him and indeed, it moved us all: Sakharov: always the optimist, he gained an inner strength that carried him from exile to the leading voice of the Soviet opposition". The Los Angeles Times. Kuptz, Kirsten (2004). Dissent in the Soviet Union: the role of Andrei Sakharov in the human rights movement. GRIN Verlag. ISBN 978-3638278348. Lee, Gary (November 12, 1988). "Sakharov says Soviet Union continues to violate human rights". The Washington Post. Lee, Gary (November 15, 1988). "President receives Sakharov". The Washington Post. LeVert, Suzanne (1986). The Sakharov file: a study in courage. J. Messner. ISBN 978-0671600709. Lewis, Anthony (July 14, 1984). "Torturing Andrei Sakharov". Sarasota Herald-Tribune. p. 21A. Lipkin, Harry (2013). Andrei Sakharov: Quarks and the Structure of Matter. Andrei Sakharov: Quarks and the Structure of Matter. Edited by Lipkin Harry J. Published by World Scientific Publishing Co. Pte. Ltd. World Scientific Publishing. pp. 1–17. Bibcode:2013asqs.book.....L. doi:10.1142/9789814407427_0001. ISBN 978-981-4407-41-0. Lizhi, Fang; Ratnesar, Romesh (June 14, 1999). "The dissident Andrei Sakharov". Time. Lord, David (December 24, 1986). "Sakharov's release cause for optimism Cotler says". The Montreal Gazette. p. A-7. Marshall, Eliot (February 8, 1980). "U.S. scientists protest punishment of Sakharov". Science. 207 (4431): 625. Bibcode:1980Sci...207Q.625M. doi:10.1126/science.207.4431.625. PMID 17749319. Medvedev, Zhores (January 9, 1986). "Sakharov's scientific legacy". Nature. 319 (6049): 93. Bibcode:1986Natur.319Q..93M. doi:10.1038/319093a0. Medvedev, Zhores (January 26, 1987). "Andrei Sakharov's return ..." The Scientist. Mervis, Jeffrey (January 26, 1987). "Sakharov release may bolster ties with West, say activists". The Scientist. Mitgang, Herbert (May 12, 2002). "A life of scientist and dissident Andrei Sakharov". The Chicago Tribune. Mollick, John (December 24, 1989). "The wisdom of Andrei Sakharov". The Washington Post. Murray-Brown, Jeremy (1988). "Sakharov, the KGB, and the mass media". In Bittman, Ladislav (ed.). The new image-makers: Soviet propaganda and disinformation today. Washington: Pergamon-Brassey's. pp. 159–200. ISBN 978-0080349398. Archived from the original on December 20, 2016. Mydans, Seth (February 18, 1977). "Sakharov gets personal letter from Carter". Schenectady Gazette. LXXXIV (121). Nathans, Benjamin (August 29, 2003). "The Sakharov Archives: a vital record of human rights history is in danger". The New York Times. Porubcansky, Mark (June 4, 1988). "Sakharov: time, trust needed for reform". Lakeland Ledger. p. 11A. Reddaway, Peter (December 24, 1986). "What future for the Sakharovs?". Sarasota Herald-Tribune. p. 7A. Rich, Vera (May 16, 1985). "Sakharov: resignation from Soviet academy". Nature. 315 (6016): 169. Bibcode:1985Natur.315..169R. doi:10.1038/315169b0. Rich, Vera (November 10, 1988). "Sakharov to stand for Supreme Soviet?". Nature. 336 (6195): 97. Bibcode:1988Natur.336...97R. doi:10.1038/336097b0. Rich, Vera (February 11, 1988). "Sakharov work acknowledged". Nature. 331 (6156): 468. Bibcode:1988Natur.331..468R. doi:10.1038/331468c0. Rich, Vera (May 12, 1983). "Soviet human rights: one-way trip for Sakharov?". Nature. 303 (5913): 106. Bibcode:1983Natur.303..106R. doi:10.1038/303106c0. Rich, Vera (1993). "East-west links: Sakharov college struggles on". Physics World. 6 (8): 9–10. doi:10.1088/2058-7058/6/8/7. Safire, William (February 2, 1977). "Russian scientist and the moral hotline". The Day. p. 8. Shanker, Thom (December 25, 1986). "Free political dissidents, Sakharov tells Gorbachev". Chicago Tribune. Simes, Dimitri (December 29, 1986). "Gorbachev and Sakharov: little has changed yet". Los Angeles Times. Teller, Edward (1991). "A life of fighting for freedom". Physics World. 4 (5): 44–45. doi:10.1088/2058-7058/4/5/28. Wade, Nicholas (February 15, 1980). "A pledge to help Sakharov" (PDF). Science. 207 (4432): 745. Bibcode:1980Sci...207S.745W. doi:10.1126/science.11643589. Archived (PDF) from the original on October 20, 2015. Wade, Nicholas (May 15, 1981). "Physicists meet to honor Sakharov: The Soviet physicist Andrei Sakharov will be 60 on 21 May; a symposium in his honor was held on May Day, not in Moscow but in New York" (PDF). Science. 212 (4496): 756–757. Bibcode:1981Sci...212..756W. doi:10.1126/science.212.4496.756. PMID 17752230. Archived (PDF) from the original on October 18, 2015. Wade, Nicholas (March 28, 1980). "Sakharov expulsion averted" (PDF). Science. 207 (4438): 1451. Bibcode:1980Sci...207S1451W. doi:10.1126/science.207.4438.1451-b. Archived (PDF) from the original on October 20, 2015. Wade, Nicholas (March 14, 1980). "Sakharov protests mount" (PDF). Science. 207 (4436): 1186. Bibcode:1980Sci...207.1186W. doi:10.1126/science.207.4436.1186. PMID 17776847. Archived (PDF) from the original on October 20, 2015. Weeks, Albert (1975). Andrei Sakharov and the Soviet dissidents: a critical commentary. Monarch Press. ISBN 978-0671009632. White, Sarah (July 12, 1973). "Will Sakharov soon be silenced?". New Scientist. 59 (854): 92. Wren, Christopher (October 10, 1975). "Andrei Sakharov fights to attain human rights". The Daytona Beach News-Journal. p. 8A. Wynn, Allan; Dewhirst, Martin; Stone, Harold (1986). Fifth International Sakharov Hearing: Proceedings, April, 1985. Andre Deutsch. ISBN 978-0233980508. Young, Benjamin (2012). "Andrei Sakharov". In Williams, Robert; Viotti, Paul (eds.). Arms control: history, theory, and policy. ABC-CLIO. pp. 307–309. ISBN 978-0275998202. Zdravomyslov, Andrei (1995). "Диссидентское движение в свете социологии конфликта. А.Д. Сахаров" [Dissident movement in the light of sociology of conflict. A.D. Sakharov]. Социология конфликта. Россия на путях преодоления кризиса. Учебное пособие для студентов высших учебных заведений [Sociology of conflict. Russia on ways to overcome crisis. Textbook for students of higher educational institutions] (in Russian). Moscow: Аспект-пресс. pp. 264–267. ISBN 978-5756700091.